I have had this app for the last couple of months and not it doesn’t open anymore. Get’s stuck on the initially screen with the logo App, please fix this. I paid for the premium service and it’s truly bothering not being able to use it. If your only goal, which is mine - to pay your bills on time - this app does exactly that. It has some minimal tracking. It’s not over complicated. one does not have to fill out all the account information for the app to do what it is suppose to. 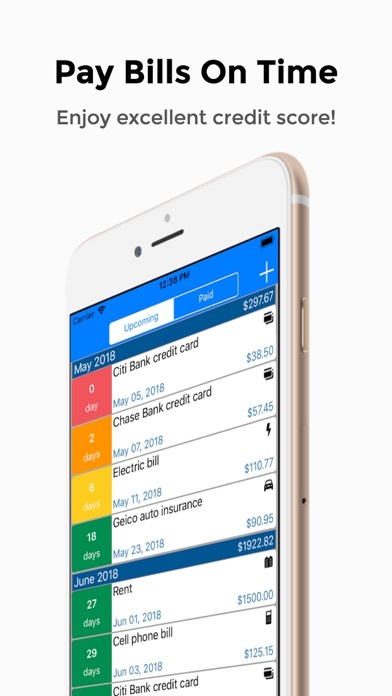 easy way to check what bills have been paid and track due dates. This was all I need - know, who to pay, when and how much - date paid and how much. Easy peezy. It is well worth the few bucks the full version cost. Who the hell only has 5 bills?? Can’t post more than 5 bills on this app. Waste of time. I open the app for the first time and you want me to rate it? I haven’t even used it. Pass. Next. Dear developer. If you can’t design an app that doesn’t immediately ask for a review before it is even used, don’t ask me to hit cancel and do it a month later. Here is a thought.... approach the issue a different way... “what is the best end experience for a user?” Not... “how can we immediately get great ratings as fast as possible.” How about that grand novel idea. I used to keep track of my paid bills on a dry-erase board and this app is way better. Easy to set up and it reminds me of upcoming bills each month. A few simple entries and the bill resets for next month. Not a money hog either. Recommended! I just purchased this app and I do not like. It does not allow you to sync to another iPad without paying for it again. Updated app and it’s now in Russian with no ability to switch language. This app worked well enough initially, but stopped working completely recently. It’s had some hiccups since I installed it a couple of months ago, but now won’t even open on my iPhone 7. Was liking it for the most part, but you can only add 5 bills per month until you have to pay for it. This has really helped me organize my bills and figure out what I need to plan for each month, however, it doesn’t open consistently making it unreliable. I cant always access the info when I need to which gets very aggravating. I’ve only been using the app for a couple of days and this coming month (Feb 2019) will be the true test of the push notifications and functionality of the app but so far I like it a lot. It has plenty of information and makes it simple to see the total due for a given month and when everything will be coming due. I like that they offer updates pretty frequently and when contacted with a couple of feature ideas they responded quickly that they would look into them. I’ll update my review if anything changes but I found my new bill reminder app for the moment! I have used a ton of apps and the developers always seem to drop the ball and stop supporting the app after a year or two so hopefully that won’t be the case here and they can just continue to improve. FaceID works great and I like that they have local as well as iCloud backup of data. Seems promising but after putting in a few bills it wants you to pay for more space. Don't list your app as free if its not free. The only thing you succeed in is wasting my time. I was looking for an app that does exactly what this app does. 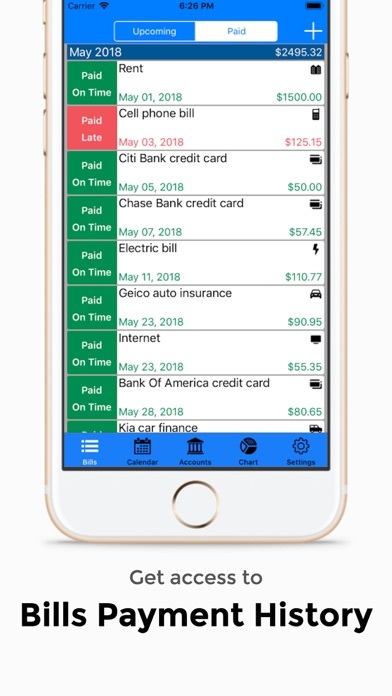 This app doesn’t require from you to link your app accounts to bank accounts, I can update my bills the way I need, app reminds me when my bills are due, it allows me to record my payments and analyze my expenses. Love this app!!! It is the closest to what I was looking for but today I was trying to add some of my January bills and the calendar is stuck on December. I tried to email to developers and that didn’t go anywhere also. How do I plan my bills without getting a new account each time? I already have the accounts! Please fix this and I’ll revise my review for 5 stars! Simplicity. Easiest bill app I’ve used and I love how easy it is to use. This app is exactly what I was looking for. Unlike some other similar apps that I tried, it has lots of necessary features. I most like app’s unique design and simplicity of using it. Developers, you did great job!!! This app works great and keeps me in check over all my bills. This app is one of the best bills managing apps I’ve ever used. Stunning and intuitive user interface, lots of functions. It gets job done and saves me a lot of time in keeping up with all my bills. I recommend this app as a must have app on your iPhone. Tried to enter my bills, but the app shut down every time I tried to pick the category. I like this app. I kept track of my bills on an excel spreadsheet. I really like all the details I can add per bill. I like reminders and pie chart. This is a great app! Pluses: 1) Colorful and pleasing to look at. 2) User-friendly. 3) Good layout (screens, buttons, etc.) 4) Plenty of Settings options to customize view Minuses: 1) Crashes often. 2) Can’t copy repeat (not recurring) bills with different amounts. Requires manual set-up for each one or toggle copying and pasting. 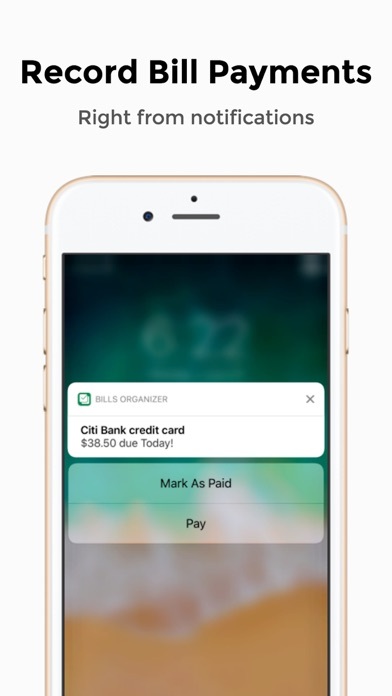 3) Would like recurring icon and/or autopay icon on Bills screen, maybe beside Category icon Nice job! Great app, it makes my life much easier! Good start. Basic use of iOS capabilities. 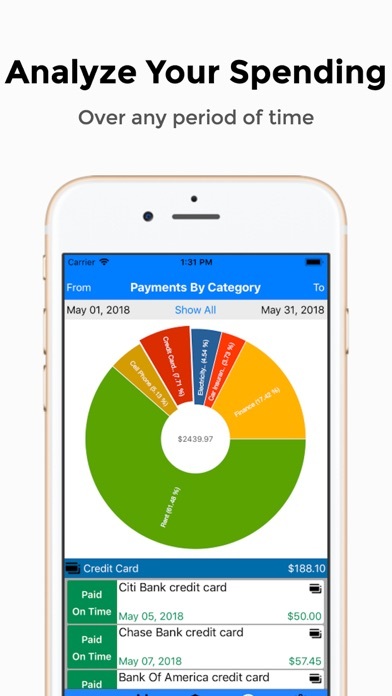 Biggest issues I noticed: hassle to delete an individual payment or bill instance & app does not support making installments on an individual bill. Recommend consideration of adding swipe to delete individual bills without having to edit them one-by-one under account. Also recommend allowing multiple payments on a single bill, for example, if $300 is due on the 1st, allow the user to input split payments like $150, $100, & $50 throughout the month, respectively, instead of just the "amount due or greater." I just got this app. As I started adding more bills I really like the layout. So easy to use. And the info really stands out so you can be aware of your spending. My only problem is as I am trying to add a new bill the app keeps shutting down then I have to start over. Please fix this. I really like this app. The app is great help for managing and paying my bills on time. I installed this app because I missed payments for few bills, and this negatively affected my credit score. Now Bills Organizer reminds me about approaching bills, and I hope I never miss payment again. I would definitely recommend this app. Love this app! Very useful and easy to use. App perfectly meets what I need to organize all my bills. 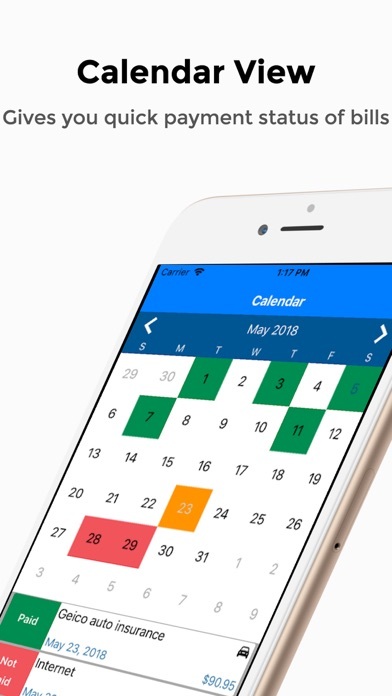 This app has a lot of features, and it allows me create semi-monthly recurring bills that many other similar apps don’t. Thumbs Up! The app is very easy to use, it makes keeping up with bills so much easier. So far I like this app. It helps me a lot to manage all my bills.